Alessandro Magini (composer-organist) studied organ and piano in Florence under the guidance of Robert Pichini and attended the masterclasses of Paul von Schilhawsky (Director Emeritus of the Salzburg Mozarteum) on piano performance practice in the lieder repertoire. Alessandro Magini graduated with honors in Musical Dramaturgy from the University of Bologna under the direction of Lorenzo Bianconi and Thomas Walker and in composition from the Conservatory of Bologna with Alessandro Solbiati. Subsequently he graduated with honors the Advanced Course in Composition of the International Music Academy of Novara. He also attended master classes and seminars with F. Donatoni, A. Clementi, G. Petrassi, N. Castiglioni, G. Manzoni, G. Ligeti, L. Berio. He has given a great number of concerts as a piano accompanist as well as an organist. As a composer and researcher Alessandro Magini focuses on the relationship between music and experimental theater. In 1999 he was appointed Professor of Musicology to the National Academy of Dramatic Art in Rome (where he has been teaching since then) and intensified his activities in music composition for theater (collaborating with directors such as Josè Sanchez Sinisterra, Piotr Fomenko, Marcello Bartoli as weel as with the Teatro Metastasio Stabile of Tuscany, Laboratory Riuniti, Rome). In 2000 he was appointed to the executive council of the “National Committee for the Celebration of the Fourth Centenary of the Birth of the Opera” set up by the Ministry of Heritage and Culture, in collaboration with the Teatro Comunale of Florence, Biblioteca Nazionale Centrale in Florence, the Teatro La Pergola . In 2003 he was appointed artistic coordinator of the Centre Magnolfinuovo Prato (training and production in the field of contemporary musical drama). He also is director of the Centro Bardi, dedicated to studies on experimental music in the Florentine Renaissance (Camerata dei Bardi). The interest in the “sound of the word” connotes some of his studies, published in journals. Many of his compositions have been performed in particulary significant places for the humanism, such as the National Central Library of Florence, Florence Marucelliana Library, Accademia della Crusca, Library Casanatense Rome, National Library of Vienna, Opera di Santa Croce in Florence. 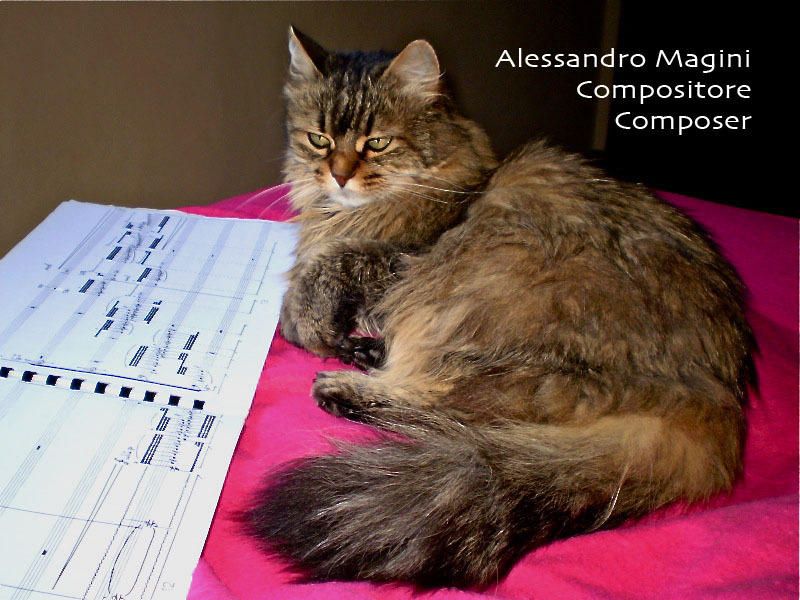 Alessandro Magini has composed several melologues for Chamber Theatre. Recently he collaborated with the philosopher Sergio Givone for a musical version (cello, guitar and narrator) of the novel “In nome di un Dio barbaro”. In the last years he has been dedicating a series of compositions to the accordion, solo and in duo with various instruments (cello, organ, guitar, flute, piano, oboe, mandolin, collaborating with I. Battiston, F. Gesualdi, D. Bellugi, F. Dillon, M. Barrera, L. Attademo, S. Malferrari, A. Avital, L. Bagnoli). The accordion is also present in his last two works: “Le storie di San SIlvestro. Una sacra rappresentazione” (mezzo-soprano, narrator, accordion duo) for the Basilica of Santa Croce in Florence and” Naviglio-fantasma” (baritone, accordion, oboe) for the exhibition “Futurism in Calabrian music” at the University of Calabria. He is a member of the Italian Academy of Cinema for the David di Donatello Awards. He is a member of the Board of Directors of the Center for Contemporary Music “Tempo Reale” (Florence) founded by Luciano Berio. His works are published by Edizioni Musicali Berben and, in digital, by Emarecords.